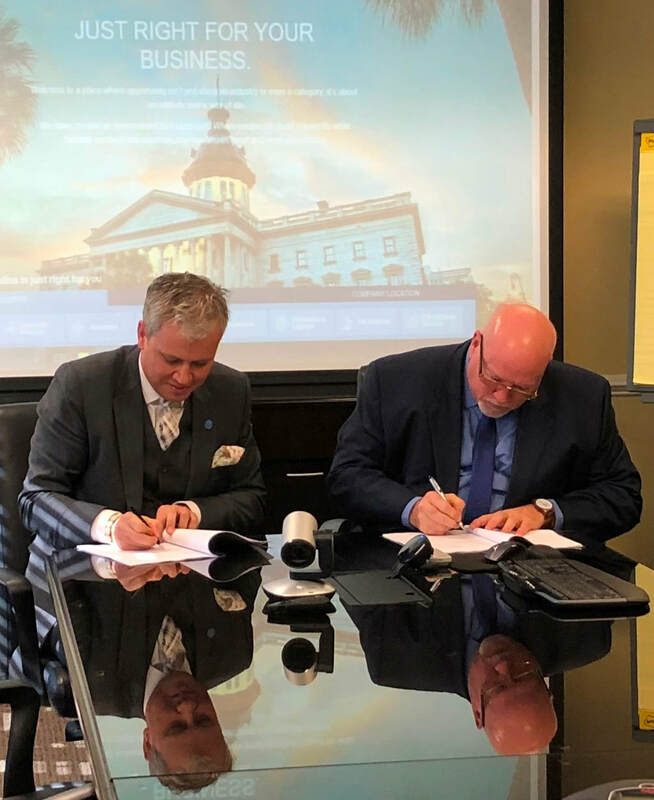 Viljar Lubi (left), Estonia’s Deputy Secretary General for Economic Development, and Jim Melville, President and CEO of the Global Alliance of South Carolina, sign the SC-Estonia Industry R&D Program agreement at the SC Dept. of Commerce on Nov. 29, 2018. ​Today, in a ceremony at the South Carolina Department of Commerce, Jim Melville, President and CEO of the Global Alliance of South Carolina (GASC), joined Viljar Lubi, Estonia’s Deputy Secretary General for Economic Development to sign an agreement that formally launches the South Carolina-Estonia Industry R&D Program, and issues the first call for binational R&D project proposals. This program implements one of the key objectives in the Agreement between the Government of the Republic of Estonia and the Government of the State of South Carolina on Bilateral Cooperation in Industrial and Technological Research and Development, signed in April 2016. The signing of this agreement initiates the first Request for Proposals within the framework of the Industry Research and Development Program. The focus of this RFP will be on collaborations involving information and communication technologies, health technologies and services, and technologies that increase the effectiveness of resources. The RFP process will be executed in two steps. First, interested partners must complete and submit an application for bilateral funding to Enterprise Estonia (EE) and GASC not later than January 29, 2019. After an initial screening of the project concept EE and GASC will invite formal proposals from qualified and eligible applicant teams. To access the full text of the RFP, including funding availability, eligibility criteria and application instructions, please visit www.globalallianceforsc.org. For more information on the Global Alliance for South Carolina, and the SC-Estonia Industry R&D Program, please contact Russ Keller, GASC Executive Director, at russ.keller@ati.org or visit www.globalallianceforsc.org. Hello! My name is Michaela, and I am spending my summer abroad in Shanghai, China, working with Xie Fei Education market after-school programs and teaching English classes. So far, I’ve been in two weeks of 7-hour Chinese language courses in preparation for my internship. Being in Shanghai, I am getting to experience a city-life unlike any other in South Carolina. The population of the greater Shanghai area is about 24 million and has skyscrapers that seem to surround you everywhere you go! One of my favorite places in the city is Nanjing Road, Shanghai’s version of Times Square. Nanjing is the place to go to get all your Western shopping needs taken care of, not to mention it has the largest Starbucks in the world, and has plenty of local stands to try as much authentic street food as you could want! But Shanghai itself reflects a lot of traditional Chinese culture, from its architecture to its festivals to even having a small-town atmosphere. Much like life in smaller Chinese villages, there are pockets of Shanghai that continue the custom of dying their own calico fabrics in the city and then drying them over these tall racks, thus creating a very mystical feeling around the village. I have also experienced the traditional holiday known as the Dragon Boat Festival. The event commemorates an admirable official from the Warring States Period who killed himself after his king banished him to the southern region by racing crew boats that are decorated like dragons. The festival also includes delicious sticky rice snacks that are stuffed with meat or sweets called ZongZi. Luckily for us, we got the day off from Chinese class to enjoy it. 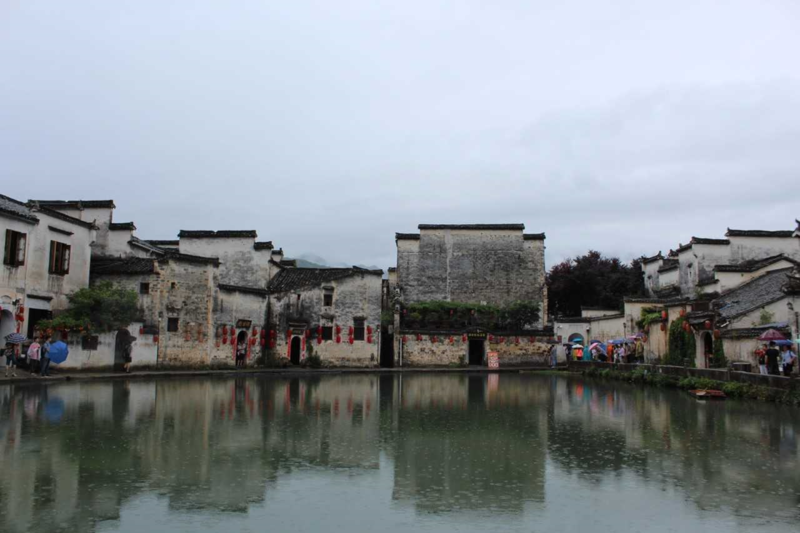 My trip has not been constrained to just cosmopolitan Shanghai, but we have had the opportunities to see the countryside, dramatic scenes of nature, and old Chinese villages. You can see some of the pictures that I captured while on these weekend trips at the bottom of this post! 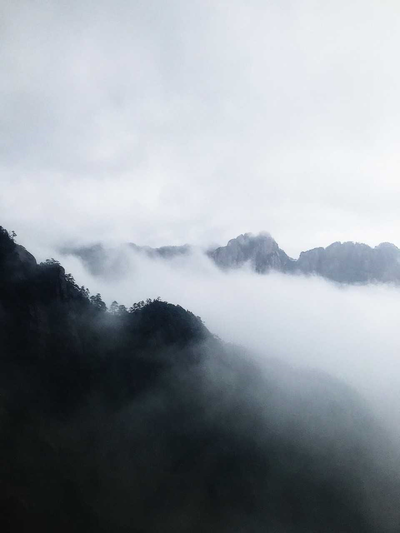 One weekend, I took a 7-hour bus ride to the Yellow Mountains, hiked for 4 hours (which to the Chinese actually means climbing incredibly steep stairs), and then reached the top to only find a blocked view because of rain clouds! But eventually on our trip, we hiked to a waterfall to find much better views of the beautiful, natural Chinese landscape. Apparently, there are aggressive monkeys in these woods but luckily no one was attacked. 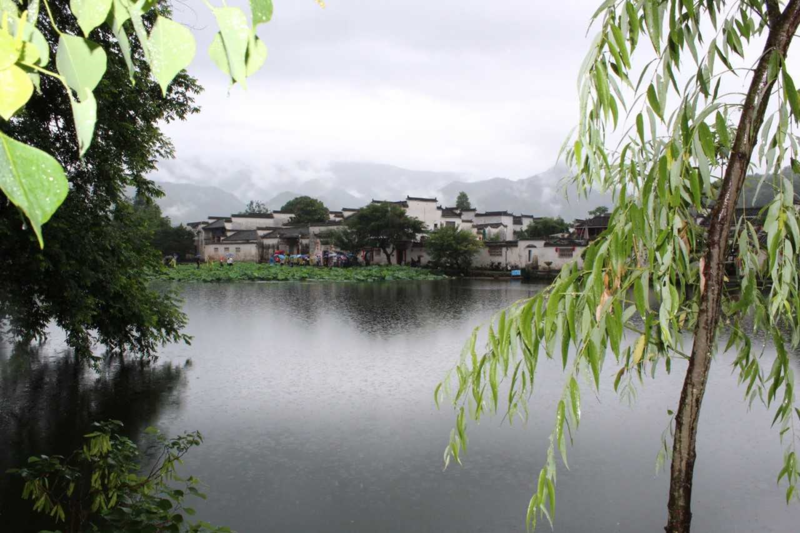 These mountains are also the location of the filming for the famous Kungfu movie “Crouching Tiger Hidden Dragon,” which is coincidentally very famous outside of China but considered a lesser quality Kungfu movie to the Chinese. I also got to take a weekend trip to Wuzhen, which is a “water town” – similar to Venice, Italy. It was interesting to compare this small tourist town to the bustling life that I have become accustomed to in Shanghai. In the smaller town of Wuzhen, the local people were more shocked to see foreigners, and our group caught some taking photos of us from afar. In Shanghai, they prefer you to take the photo with them and/or their babies! The biggest difference that I have noticed thus far between the culture here and that of the United States is how the Chinese approach privacy. I have experienced everything from co-ed bathrooms without stalls on the doors to old men walking around in their boxers. I have even seen babies with the backs cut out of their pants so they can use the restroom in the streets. Luckily, this culture shock is not usually this severe. My biggest challenges that I face in Shanghai are getting used to the large crowds everywhere (and all the time) while not being able to breathe as easily as I am accustomed to back home. Although the experience has just begun, I have been so fortunate to see and do things that have pushed me out of my comfort zone! Life here is so different but beautiful in all its centuries upon centuries of history, culture, and life. ​I can’t wait to see what the next 6 weeks hold for me! ​For Trita Parsi, president of the National Iranian American Council and professor at the Edmund A. Walsh School of Foreign Service at Georgetown University, the Iran nuclear deal was designed from a series of internal developments and a variety of secret negotiations going on behind the scenes. More formally known as the Joint Comprehensive Plan of Action (JCPOA), the agreement’s international role is best revealed through informal discussions amongst the seventy-five individuals on both sides that Mr. Parsi had interviewed along the way for both his advisement to the Obama administration and his latest book, “Losing an Enemy: Obama, Iran and the Triumph of Diplomacy” (2017, Yale University Press). An award-winning author and a leading expert on U.S.-Iranian relations, Trita Parsi will speak on the various forms of diplomacy that led to the nuclear deal, the risk of a potential U.S.-Iranian armed conflict, and his thoughts on recent domestic events within Iran at “The Risk of War with Iran: a talk by Trita Parsi,” an event hosted by the Columbia World Affairs Council, Tuesday, March 13, from 12pm to 2pm, at The Palmetto Club (1231 Sumter Street). “Losing an Enemy” certainly serves as a treatment of the many backstories that the Obama administration conducted with Iran leading up to the deal, but also emphasizes that the same issues reach beyond any restriction or maintenance of Iran’s nuclear program. Parsi is also recognized in high regard for his 2007 book, “Treacherous Alliance: The Secret Dealings of Israel, Iran and the United States,” which won the Council on Foreign Relations’ Arthur Ross Book Award and the Grawemeyer Award for Ideas Improving World Order. Decades of U.S.-led sanctions related to Iran’s nuclear program and proliferation date back to 1979, the year of the Iranian Revolution. The Iranian government has repeatedly stated its nuclear program is utilized nationally for electricity, medical purposes, and other forms of resources for Iranian civilians. These claims have done little to stop the U.S. and the UN Security Council from imposing sanctions each decade that target Iranian investments in or exports of oil and any form of financial cooperation with the Iranian Revolutionary Guard Corps (IRGC), a branch of Iran’s Armed Forces with operations beyond Iran’s borders related to foreign interference or threats to its Islamic Republic system. Such targeting of the IRGC has ranged from domain name and web-hosting services to banking transactions. With such context having served as precedent for international policymakers prior to the JCPOA’s formulation, it is essential to view this particular diplomatic relationship from a holistic regional vantage point. In other words, U.S.-Iranian relations and what the JCPOA represents goes well beyond the headliners that many are accustomed to: transcontinental weapons shipments by Hezbollah, the Iranian government’s unfrozen tens of billions in Asian central banks, networks of disguised foreign exchange transfers, arms deals with Russia, etc. Much of how the U.S. government views Iran relates to the larger interpretation of what the Middle East represents for American interests. More generally, the regional balance of power has shifted significantly due to the invasion of Iraq, which, in turn, has weakened Israel, Saudi Arabia, Egypt, and other U.S. allies. If one were to assume that the Middle East is essential to U.S. national security, the U.S. must act and act with strong consideration. If one were to view the Middle East as not nearly as valuable as it had been decades ago, the costs of American hegemony in the region are to be much less significant. Yet, at the moment, there are three failed states and possibly two more in the region. By such indications, one could confidently suggest that costs of U.S. regional leadership have increased dramatically. With weaker allies, competitors from East Asia now have the capacity to influence major international decisions. From China’s perspective, increased U.S. involvement in the Middle East is received positively, as the Chinese focus has transitioned to Africa and South America, where the U.S. has been less attentive over the past decade. During the Obama administration, key gaps in staffing and presence across Asia spurred a shift in strategy. The rise of official and unofficial Iranian presence across the Middle East has also yielded domestic turmoil within Iran’s borders. The uprisings beginning at the end of 2017 left many surprised that a chain of protests across the country could occur quickly without growing expectations of national and international public perception. As evidenced by the protests, President Hassan Rouhani is no longer afforded the luxury of shifting the leverage of national politics into a regional context. This is especially true when there is considerably less American and Israeli malfeasance and the relative success of Shia militias in Iraq and Syria. Even with the leaderless uprising emerging within various Iranian cities at once, the reaction of the government wasn’t nearly as brutal as it had been in 2009 during the Green Movement, which consisted of its own political leadership that translated the Iranian people’s public anger and national anxiety more effectively. This time, the leaders from 2009 were on the sidelines. After all, with many of the protesters in their twenties and unemployed, the connection and transparency with the Iranian middle class wasn’t as pronounced, or clear for that matter. “If they had been more involved, it would have been more potent. There were beliefs that it could lead to something more serious that no one wants,” explains Parsi. During “The Risk of War with Iran: a talk by Trita Parsi” held by the Columbia World Affairs Council, Parsi will present in greater detail the many talks and operations that preceded the international agreement of the JCPOA, how close the U.S. was in fact to actually engaging in war with Iran, and further insight into internal political movements within Iran. ​REGISTER HERE! ​Austin Nix began working with Columbia World Affairs Council in July of 2017. Before graduating from the University of South Carolina in 2016 with degrees in Spanish and French language with a minor in linguistics, Austin had lived extensively in both France and Spain and had worked with the Student Success Center at USC for five years as a Supplemental Instructor of Inductive and Deductive Logic for the University's Department of Philosophy. At CWAC, Austin has served as intern, research coordinator, and program officer and co-coordinator of international visitor leadership programs (IVLPs) through the U.S. State Department. Additionally, Austin has collaborated with Midlands Anchor as an economic development analyst and currently works at PricewaterhouseCoopers as a risk and regulatory consultant. Ultimately, Austin aims to pursue career interests that include foreign policy, cybersecurity, and global economics. Austin can be reached at austin.nix@columbiaworldaffairs.org. As the world’s balance of power shifts, there’s much indication that China has finally reached its position at the epicenter of international policy and economics that many had predicted for decades. Whether it’s President Xi Jinping’s ongoing ideological ambitions, the expansion of Chinese markets and the evolution of foreign investment strategies, or regional disputes in East Asia, China has assumed its role front and center as a guiding international force. On February 13th, The Columbia World Affairs Council hosted a presentation detailing the future of U.S. economic foreign policy and our nation’s relationship with China, entitled “China and the United States: Cooperation beyond Competition.” The presenter, Yanxi Liu, Regional Economic Research Assistant, Division of Research, at the University of South Carolina’s Darla Moore School of Business and the U.S. Representative for Sanmenxia Sister Cities, outlined not only China’s economic and national policy and the pivotal role played by Sister City relationships, but she also provided those in attendance with greater insight into China’s overall economic approach to investment and trade with South Carolina. According to Yanxi, the held stereotypes of the Chinese market must be reconciled to understand why the U.S. and the state would establish a corporate partnership with China or promote Chinese tourism for that matter. Quite simply, China’s GDP annual growth rate of 6.8% has made a dramatic impact on South Carolina’s economy, creating 259 jobs and bringing $200M to the state with $69M coming into the University of South Carolina. In most cases, the tuition of a Chinese student studying in the U.S. is paid for by their family in cash, not through loans. This same direct cash stream used additionally for transportation costs and living expenses stimulates the U.S. economy with 45k jobs each year. Considering that these students generally enter into engineering and computer science departments, such an influx of Chinese academic influence on American universities has contributed example after example of innovative improvements to technology. However, Chinese and other international students typically return after their semester(s) abroad, as many of them have difficulties finding jobs or internships upon completion of their education. If neither job nor internship are obtained within the three months after graduating or completing their education, an Optional Practical Training (OPT) status, allowing them to legally stay for another year, is deemed unavailable to the student. Even if an international student is granted the allotted twelve months of OPT status, the individual requires an H-1B visa that allows U.S. employers to employ foreign workers in specialty occupations. For many international students, such a series of obstacles encourages a return home to test respective job markets. Apart from U.S. universities acting as a form of direct Chinese investment in the U.S. economy, if there’s one key takeaway from both President Xi’s speech at the 19th National Congress of the Communist Party of China (CPC) last fall and the World Economic Forum’s Annual Meeting at Davos in January, it’s that China’s investment in technology will be the primary focus from this point into the future. This represents a major shift in economic principle, reshapes the outsider’s impression of what the Chinese economy is capable of, and creates seemingly boundless social implications. Make no mistake, Chinese real estate investment is still the largest form of investment in the U.S. All in all, China being the second largest trade partner of the U.S. and the E.U. over the course of the past five years that Xi has been in office will be far from jeopardized. Although, where the Chinese economy can really grow beyond anyone’s expectations is through the technology sector and tech consumer demand. Chinese companies no longer have to rely on price for market share, but simply the quality of the product. Huawei, China’s telecom market leader, is beginning to go head-to-head with Apple, incorporating hardware before Apple’s releases of iPhones. But Chinese smartphone makers aren’t the country’s true technology leaders; it’s their internet companies. As forecasted, the Chinese economy’s future will be largely reliant upon its internet companies that are bound by the Chinese government’s regulations, but must also cater to their customer base that expects innovative services. The “Great Firewall,” a system of online restrictions designed for mass censorship, has become the world’s largest non-tariff barrier that invariably protects the Chinese economy from U.S. competition. The world’s largest retailer, Alibaba, is a mix of Amazon, Twitter, and PayPal that uses various forms of robotics and drones to deliver products. Social media and gaming giant, Tencent, has a market values that is greater than Facebook’s. Baidu, China’s version of Google, mimics Google’s investment in A.I. Internet giants and smartphone makers are now the peers of Silicon Valley rather than previously having been labelled as imitators. Even though the “Apple effect” may have provided the blueprint for this corporate tech surge in China and regardless of whether Apple leads by a considerable margin to these Chinese companies in terms of profit, Amazon, Facebook, and Google have either been met with innovative competition or have been surpassed. The restrictive nature of the Chinese market has made these companies larger, more profitable, and more advanced, which directly impacts how much China invests overseas, and more applicably, in the South Carolina. According to the South Carolina Research Authority (SCRA), there are growing expectations that Chinese investment within the state and the Chinese market’s availability to South Carolina will continue to expand. In terms of the Chinese businesses and corporations investing in South Carolina, Chinese automotive, consumer electronics, and advanced materials mainstays have flocked to the Palmetto state. Volvo Car USA projects the employment of 2k people over the next decade at its new factory in Berkeley County, South Carolina. More notably, the parent company of Volvo Cars, Geely, is a Chinese multinational automotive manufacturing company. Chinese consumer electronics and home appliances company, Haier, established manufacturing operations in Kershaw County, South Carolina in 1999. Haier has recently expanded these operations in Camden with a $72M expansion that will add more the 400 jobs over the next five years. Sun Fiber LLC, with manufacturing and production operations in Rock Hill, South Carolina, is a wholly owned subsidiary of the Chinese company, Cixi Jiangnan Chemical Fiber Co., LTD based out of Zhejiang. Of the fifteen to twenty Chinese companies in South Carolina, some are manufacturing providers for a very unlikely, yet famous foreign investment cornerstone within the state: BMW. Despite the Trump administration’s unpredictable, even isolationist, economic, and political relationship with China, one must appreciate China for exactly what it is and, now more than ever, what it more broadly represents. Ultimately, China’s social and economic impact on South Carolina and the state’s capital has spurred a statewide and citywide boom all its own. ​​​Austin Nix began working with Columbia World Affairs Council in July of 2017. Before graduating from the University of South Carolina in 2016 with degrees in Spanish and French language with a minor in linguistics, Austin had lived extensively in both France and Spain and had worked with the Student Success Center at USC for five years as a Supplemental Instructor of Inductive and Deductive Logic for the University's Department of Philosophy. At CWAC, Austin has served as intern, research coordinator, and program officer and co-coordinator of international visitor leadership programs (IVLPs) through the U.S. State Department. Additionally, Austin has collaborated with Midlands Anchor as an economic development analyst and currently works at PricewaterhouseCoopers as a risk and regulatory consultant. Ultimately, Austin aims to pursue career interests that include foreign policy, cybersecurity, and global economics. Austin can be reached at austin.nix@columbiaworldaffairs.org. The “mobility revolution” arrived before many realized that it was altering our environment, influencing our decisions, or had even identified it. In 2018, “mobility” is more than incorporating autonomous vehicles and delivery drones alongside the cars we drive and the trains we catch. In fact, it’s more about how people and goods move, what we have access to, which questions we ask and answer, and how we define innovation as a concept. 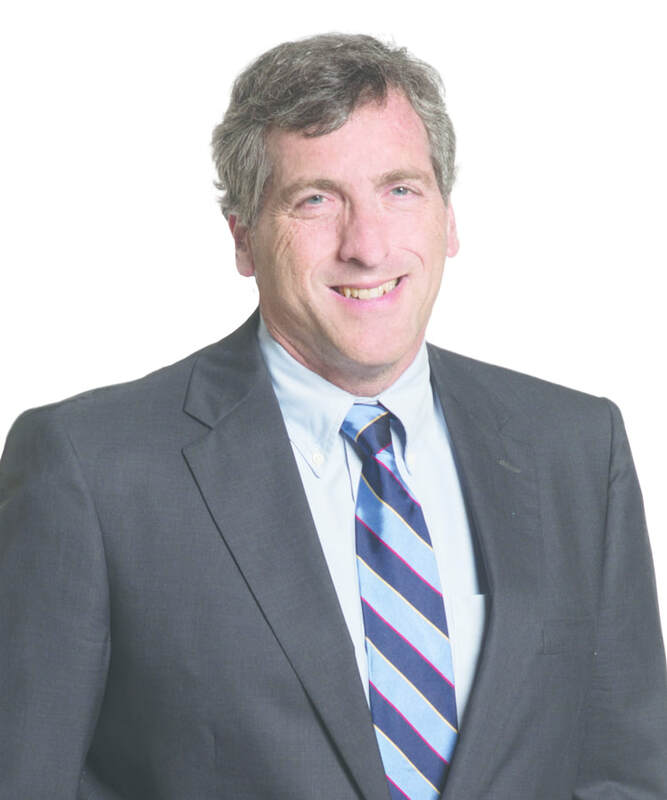 According to Morris Ellison, of the transatlantic law firm Womble Bond Dickinson, the “mobility revolution” is about opportunity. This past October, as part of Columbia World Affairs Council’s Distinguished Speakers Series, Ellison presented “Building a Transportation Innovation Center in South Carolina,” an analysis of the German-Israeli-American Innovation Triangle, the many factors available to South Carolina, and its emerging role as not only a national, but global, competitor in advanced manufacturing and technology research. To all outward appearances, South Carolina is a small state that is simply attractive for tourism, especially the City of Charleston. However, few realize that it is increasingly technology, not tourism, driving the Charleston economy or just how attractive Charleston has become to the young workers who form the backbone of most knowledge based companies. The past decade has propelled South Carolina onto the international stage. The state has led the country in foreign direct investment (“FDI”) in at least 3 of the past 5 years. International investment has tended to cluster around the Greenville, Columbia, and Charleston metro areas with over $16 billion of FDI being invested in South Carolina creating over 27,000 new jobs. In fact, nearly 1/3 of all jobs announced in South Carolina between 2011 and 2016 were the direct result of FDI. Conversely, as population rapidly increases across the state, the sprawling growth patterns present new challenges in rising infrastructure costs, traffic congestion, a lack of accessibility to public transportation, and less availability of the necessary workforce. Yet, to Ellison and others throughout the state, herein lies tremendous opportunity. South Carolina is far more accepting of change than it was just a decade ago and is small enough to facilitate internal collaboration amongst its many resources. In terms of the reaction to the unique circumstances surrounding the existing economy within the state, South Carolina is following the lead of another small state: the state of Israel. To much acclaim, South Carolina is the North American home to many foreign automotive manufacturers including Mercedes and Volvo in Charleston and, perhaps most famously, BMW in Greer. Likewise, virtually every American and German auto manufacturer has established an innovation center in Israel, known to many as the “start-up nation.” Various other American and German manufacturers have opened numerous R&D centers throughout Israel. From the real time GPS technology of Waze (purchased by Google in 2013 for approximately $1 billion) to the collision avoidance technology of Mobileye (purchased by Intel in 2017 for $15 billion) to the cyber technology of Argus Security (purchased by the German company Continental in 2017 for $430 million), Israeli technology tends to lead as the start-up nation impacting the world. The first tech-related advancement manufactured by a German company often originates in an Israeli R&D center. These centers are scattered throughout the country. Helping South Carolina companies and policymakers familiarize themselves over the past seven years with the Israeli tech ecosystem, Ellison and others involved in the South Carolina Israel Collaboration have helped South Carolina benefit by examining multiple statewide policies used in Israel and many forms of advanced technical and financial assistance to develop and commercialize R&D centers, thus creating a network of public, private, and university organizations. As a direct result of the Collaboration’s efforts, South Carolina is now the only state in the United States which has a trade agreement with Israel that offers a built-in funding mechanism. Ellison notes, “Israel’s natural resource is knowledge and information, so Israeli companies’ markets are worldwide.” South Carolina affords companies with the opportunity to participate in an ecosystem in close proximity to the markets that they serve. Encouraging R&D centers to apply their knowledge to manufacturers allows manufacturers to develop more sophisticated products quickly in order to address rapid changes in the marketplace. The co-location of 1/3 of Boeing’s worldwide IT with its 787 manufacturing facility in North Charleston offers a case in point. In theory, combining and consolidating the cooperative forces of research, development, innovation, and production increases the ability for companies to be nimble and adapt to changing technologies and markets. Pair this with the practical application of new “big data” collection techniques by data companies and public-sector initiatives, your company and, therefore, your innovation triangle are provided with insights that were once inconceivable. However, developing South Carolina’s very own innovation triangle remains easier said than done. Ultimately, data analytics and automation cannot totally remove subjectivity, though artificial intelligence (“AI”) is trying to push the envelope as hard as it can. Designing and creating an environment that combines the suitable research initiatives, an available workforce, and the necessary capital investment seems otherwise improbable without the collaboration of private, public, and academic resources. Why haven’t we seen more of this collaboration in the United States? According to Ellison, “when it comes to knowledge-based companies, the metrics aren’t a good fit for how states recruit companies.” The primary metrics in recruitment are capital investment and numbers of jobs. Capital investment is taxed, albeit often at lower initial rates for new companies as a result of incentives. Start-ups don’t usually involve high capital investment. The jobs offered by a knowledge based company are often fewer, but usually offer a substantially higher rate of pay. However, the multiplier effect of knowledge based jobs is often 4 to 1 when compared with a 2 to 1 impact of manufacturing jobs. Incentives, which often take the form of tax credits, are not attractive to start-ups which are usually not making money and thereby are unconcerned with taxes. Regardless, to welcome and to embrace the change introduced by the “mobility revolution” and the state’s rapidly growing economy, South Carolina must assert itself as an innovative global competitor. As Morris Ellison put it, “The question is whether we want to compete in the evolving knowledge and advanced manufacturing economies. You guarantee failure by not trying.” Big data strategy, implementation, and the “mobility revolution” will only continue to improve the livability of our communities, transform our cities, and protect the environment. Concerns related to privacy, safety, and security has dramatically shaped public opinion, impeding the subsequent adoption of many innovative technologies and the solutions they offer. When the rate of innovation is unstoppable and even increased due to emerging technologies working to enhance the very rate itself, one has the choice of fewer or greater outcomes. South Carolina’s emergence and recent notoriety is clearly a testament to pursuing the latter. The touchstone of many technological advances is collaboration and cooperation. The question is, when will South Carolina identify synergy and its brainpower as its most abundant natural resources? ​​Austin Nix began working with Columbia World Affairs Council in July of 2017. Before graduating from the University of South Carolina in 2016 with degrees in Spanish and French language with a minor in linguistics, Austin had lived extensively in both France and Spain and had worked with the Student Success Center at USC for five years as a Supplemental Instructor of Inductive and Deductive Logic for the University's Department of Philosophy. At CWAC, Austin has served as intern, research coordinator, and program officer and co-coordinator of international visitor leadership programs (IVLPs) through the U.S. State Department. Additionally, Austin has collaborated with Midlands Anchor as an economic development analyst and currently works at PricewaterhouseCoopers as a risk and regulatory consultant. Ultimately, Austin aims to pursue career interests that include foreign policy, cybersecurity, and global economics. Austin can be reached at programs@columbiaworldaffairs.org.